We are usually told that fish and shrimps are good for us – they are a low fat, high protein food, and contain omega-3 fatty acids that our body needs. This might be true, but it all depends on the source of the fish and shrimps on your plate. Shrimps are America’s number one seafood. They are eaten as a quick snack, prepared as a side dish and are an invaluable part of many sushi rolls. Various supermarkets sell imported wild and farmed shrimp at a surprisingly low price. Have you ever wondered how come food that has traveled from the other side of the planet is so cheap? Natural, unpolluted shrimp is an extremely healthy food, as it is abundant in protein, and it also contains a unique source of the antioxidant and anti-inflammatory carotenoid nutrient astaxanthin. Shrimps also contain vitamin B12, and D and Magnesium. However, this is not the case with the farmed shrimp that is sold in the U.S., as they have been harvested and raised in a completely different way making them unhealthy and even toxic. According to a report from Food & Water Watch, in 2006, more than 90 percent (about 868,265 tons) of the U.S. shrimp supply was imported. Thailand is the leading exporter of shrimp to the United States, followed by Ecuador, Indonesia, China, Mexico and Vietnam. U.S. consumers often have no way of knowing where the shrimp they purchase was produced. Under the Country of Origin Labeling Law, labels on fresh seafood are required to tell consumers where the fish was farmed or wild-caught. However, nearly 50 percent of the shrimp found in grocery stores have no label because they have been processed and thus are exempt from labeling requirements. In order to export large quantities of shrimp, shrimp farm operators densely stock their ponds to produce as much as 89,000 pounds of shrimp per acre. The water is quickly polluted with waste, which can infect the shrimp with disease and parasites. In response, many such operations in Asia and South or Central America use large quantities of antibiotics, disinfectants and pesticides that would be illegal for use in U.S. shrimp farms. It has now been revealed that seafood raised on pig feces and crawling with flies is being sold to U.S. consumers. The Bloomberg Markets magazine, in a piece on food poisoning and safety, says that it is common practice in some parts of Asia to feed fish pig waste. One of the biggest exporters of shrimp to America is Vietnam, with over 100 million pounds of shrimp annually, that is, almost 8% of all shrimp consumed in the United States. However research has revealed that the shrimps at some plants in Vietnam are packed in ice made from water often found to be contaminated with bacteria and unfit for human consumption. The microbiologist Mansour Samadpour, specializing in investigating water used for shellfish farming, claims that the water they use actually support the development of diseases and bacteria. Shrimp farm operators stock their ponds to produce as much as 89,000 pounds of shrimp per acre. For comparison, traditional shrimp farms yielded up to 445 pounds per acre. As a result the ponds are quickly polluted with waste, which can infect the shrimp with disease and parasites. In order to solve this problem, shrimp farmers in Asia and South or Central America use large quantities of antibiotics, disinfectants and pesticides that are illegal for use in U.S. shrimp farms. According to a study, shrimp disease outbreak has become a growing concern for shrimp farmers, and as a result, they rely on chemicals that are direct sources of pollution to the shrimp and environment. Although you would think the U.S. government would help stop contaminated shrimp from entering the country and being sold at our markets. The FDA inspects food shipments to the United States, including seafood shipments, but the agency’s resources are limited, says Bloomberg’s report. The U.S. Food and Drug Administration only inspects less than 2 percent of seafood that’s imported into the United States. This means that we’re buying and eating farm-raised fish that contain antibiotic-resistant bacteria, antibiotics and pesticide residues. One of the preservatives used to prevent shrimp discoloration is 4-hexylresorcinol. Scientific study published by the American Chemical Society found that this additive acts as so-called “xenoestrogens” — substances with estrogen-like effects that are stirring international health concerns. The side effects range from reduced sperm counts in men to an increased risk of breast cancer in women. It has now been revealed that Thailand, the world’s largest exporter of shrimp, uses slave labor, which makes their products so affordable. But human rights are not the only reason you should think twice before you buy your next package of shrimp from Walmart or Costco. The Guardian, one of Britain’s biggest newspapers, published a story on Thailand’s slave labor in June 2014. Following a 6-month investigation, they had sufficient evidence to go public and expose the fishing industry and all the supermarkets that buy from them. Large numbers of men, mostly migrant workers from Burma (Myanmar) and Cambodia, are bought and sold like objects and held against their will on fishing boats off Thailand. These men are often made to work for 20 hours a day, receive no payment, are physically and psychologically abused, and sometimes even killed. The fishing boats usually catch tuna, but they also have a lot of bycatch, which they call ‘trash fish’. Trash fish include small and inedible fish that they sell to the world’s largest prawn farmer, the Thailand-based Charoen Pokphand (CP) Foods, which uses it to feed its farmed shrimp. CP Foods sells shrimp to leading supermarkets around the world, including the top four global retailers: Walmart, Carrefour, Costco and Tesco. CP Foods and its subsidiaries sell frozen and cooked prawns, or ready meals such as prawn stir fry. The company admits that slave labor is part of its supply chain! Even if you buy shrimp that hasn’t come from Thailand, you should be aware that shrimp business is a nasty one, and often contributes to the devastation of ocean life, and destroys mangrove habitats and local communities. To farm shrimp, vast areas of coastal land and lush mangroves are wiped clean across Asia and South America, and then polluted to the point where nothing else can live and grow in them. Wild shrimp are caught using massively large, heavy nets called trawls, which catch everything in their path and destroy the coral reef. You can, however, find sustainable shrimp options. US consumers should opt for shrimp that were wild caught in the United States. Organic Authority advises buying the tiny little pink shrimp that come from the Pacific Coast. They are harvested sustainably with small nets and traps in local waters. Freshwater prawns and wild shrimp from the Atlantic Coast or Southern parts of the US are also good choices. If buying farmed shrimp, choose those farmed locally. It’s best to avoid the big supermarkets and instead visit the local co-ops, health food stores, specialty markets or local seafood suppliers. Tilapia is one of America’s most popular fish. According to the National Fisheries Institute, this freshwater fish has become the fourth most eaten seafood in the US. It turns out tilapia is always farm-raised, and often imported from China. Eating it might cause you more harm than good. And the same goes for many other farmed fish, such as salmon, cod, sea bass, and catfish. Farmed tilapia has a high inflammatory potential, which could lead to heart disease, asthma, and joint problems. In fact, researchers from Wake Forest University have found that tilapia has higher inflammatory potential than that of a hamburger or pork bacon. Farmed tilapia contains far less omega-3 fatty acids than some other fish varieties. Omega-3 is anti-inflammatory, and works in conjugation with omega-6 fatty acids. The ratio between the two is very important, and when it’s out of balance, an inflammation can develop. Generally speaking, farmed fish contain high concentrations of antibiotics and pesticides. The fish live in crowded pools and are given antibiotics to survive. To combat sea lice, strong pesticides are sprayed on them. The conditions are supposed to be particularly bad in China. The Economic Research Service of the US Department of Agriculture reported on alarming conditions in many Chinese seafood farms. There have also been rumors that fish are fed chicken and pig feces, but this has not been confirmed. Nonetheless, if your farmed fish comes from China, it will likely contain high levels of chemicals and antibacterial drugs (nitrofurans). This has also been discovered by Seafood Watch when testing different fish samples. There are many other chemicals that can be found in farmed fish, including dibutylin and dioxins. Dibutylin is known to impair immune system function, and dioxins have been identified as carcinogens. For example, farm-bred salmon has 11-times higher dioxin levels compared to wild salmon. As mentioned above, it is important to know where the fish comes from. For tilapia, the best choice is fish raised in the US, Canada and Ecuador. However, the labeling is not always transparent, and some seafood products are exempt from having to label the food’s origin. Also, there is no way to know if farm-fed fish were raised on a GMO diet. 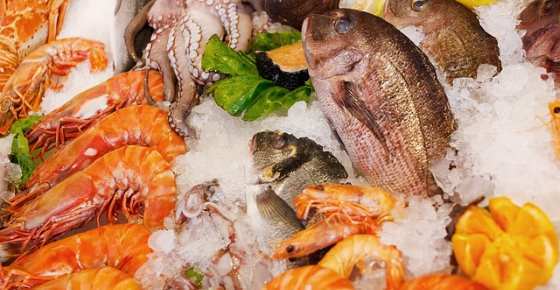 There are no guidelines in place yet that would classify seafood as organic. The Australians have also awarded the green label to Australian bonito, sea mullet and trevally, which are great sources of omega-3 fats. Humanity is hungry for protein, but the question of how to consume fish ethically is a big one, and it yet needs to be answered. Related: Why Farmed Salmon can be Extremely Toxic. A good choice for people in North America is wild-caught bluefish. If you catch them yourself, just be aware that they are aggressive, have sharp teeth, and can nip off fingers from those who are careless. The US is importing over 96 % of its seafood, most not being safe and farm raised.We should demand more wild caught seafood and our fishermen should be allowed to supply our country.The US should find ways to provide more sustainable seafood and reduce imports. The fact that the author doesn’t understand that the plural of shrimp is shrimp (not shrimps) makes this article questionable… Now please excuse me while I go hunt gooses and deers. Hi Mark, The noun shrimp can be countable or uncountable, and it is acceptable to use both shrimp or shrimps. see https://www.merriam-webster.com/dictionary/shrimp where they say “plural shrimp or shrimps”. Good luck in hunting your “gooses” and “deers”. Mark you’ve made a fool of yourself. I hate all these people that think they know everything only to come out as idiots. Go hunt your gooses and deers and leave us alone!